Nature has played a very central role in the Japanese aesthetic for thousands of years. In that sense, the tranquil home we will explore today is very typically Japanese. It is a two-level home arranged around a central courtyard. The walls are almost entirely made of glass and the natural elements infuse the living spaces with a bright, airy feel. 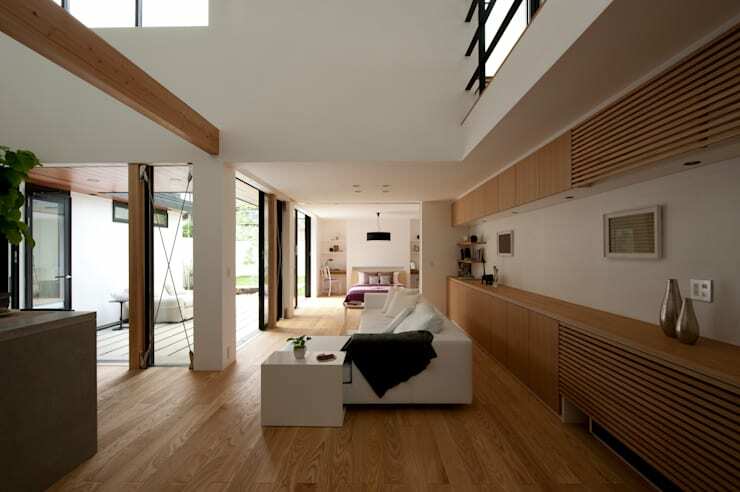 The home also has a few very distinctive elements that reflect the Zen spirit. The window views have been very carefully framed, a simple pathway has been turned into a work of art and the entire feel of the home is incredibly serene. It comes to us courtesy of Japanese architects Sakurayama-Architect-Design. The central courtyard makes the home feel more like a private oasis than a home set in a suburban neighbourhood. The walls of the home embrace the courtyard on three sides. This creates that all-important privacy, while still allowing lots of light to penetrate the space. The courtyard or outdoor deck is extremely minimally furnished and has a floor made from simple wooden cladding. The rock garden and small grassy area are also very simply landscaped. The architects have named this project ’House with a Bird Bath’ after the small stone birdbath in the foreground. On the other side of the home, we find this simple and serene entrance. The striking geometry of this space really sets the feel for the home. The entranceway is almost perfectly divided into three panels. 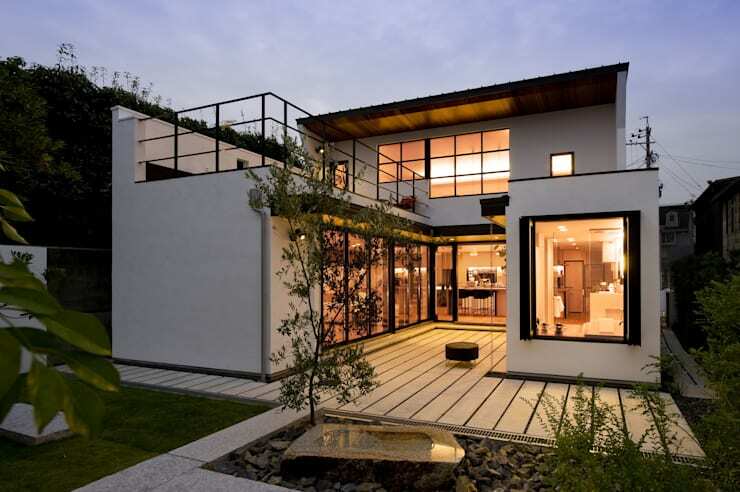 The glass on either side reflects the open, welcoming theme of the home. But our focus is really on the wooden features. 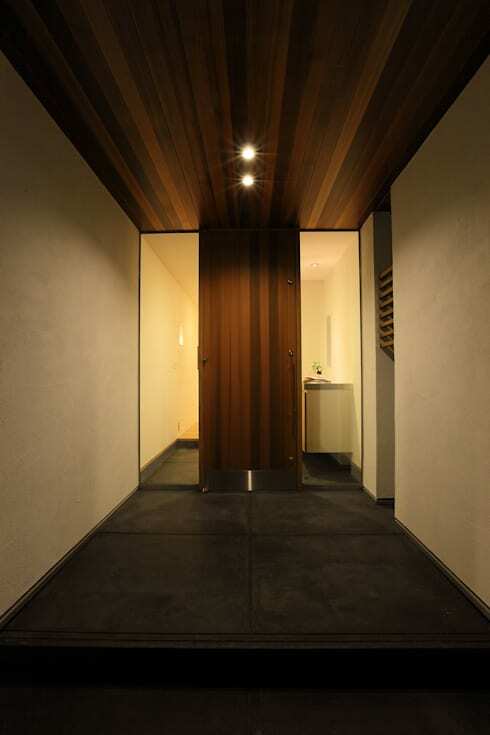 The grain of the wooden ceiling beams really draws the eye forward towards the front door. This movement is continued as the grain from the wooden door draws the eye downward. The courtyard may be the obvious highlight of the home, but the simplest spaces have been treated with the same attention to detail. 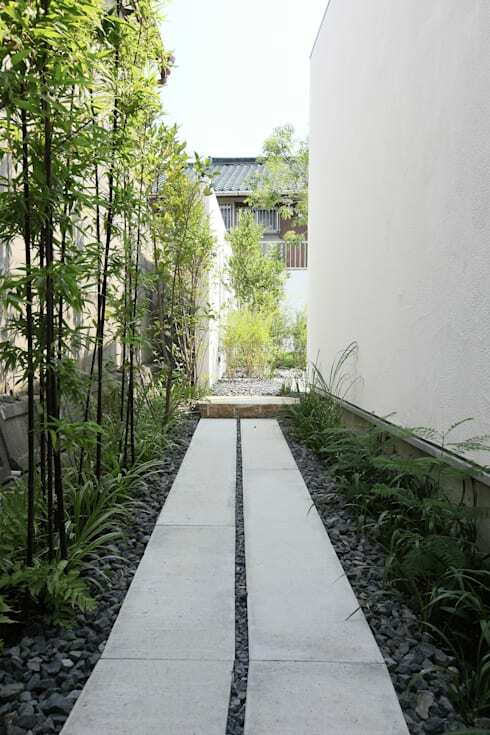 This simple, path that runs along the side of the home has been turned into a striking space. The path is composed of two narrow concrete paths that run parallel to each other. Japanese architecture often embraces the element of imperfection and irregularity. Here, we can see how the lines of the path are very slightly angled for interest. The living spaces all face the courtyard we saw earlier. The kitchen has a very strong connection to the outdoor area. It has broad glass doors and double height ceilings. This allows lots of light to flood the interior and gives the kitchen a very bright ambience. Finally, note how the kitchen island has been extended to create a great dining area. This bench is a great place to enjoy the ambience of the courtyard. 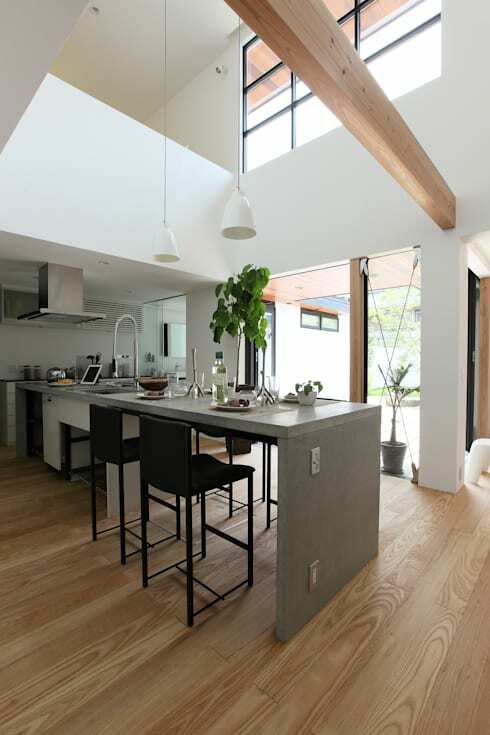 The U-shaped configuration of the home creates a very natural division of space in the open-plan layout. The sofa and living area has been further delineated by the visual aesthetic of the room height. Here, we can see how the double height of the room makes the living room feel social. Note the more private bedroom in the background with the lowered ceiling. The upper level has more private rooms than the lower level. But this level still benefits from the bright profusion of natural light. 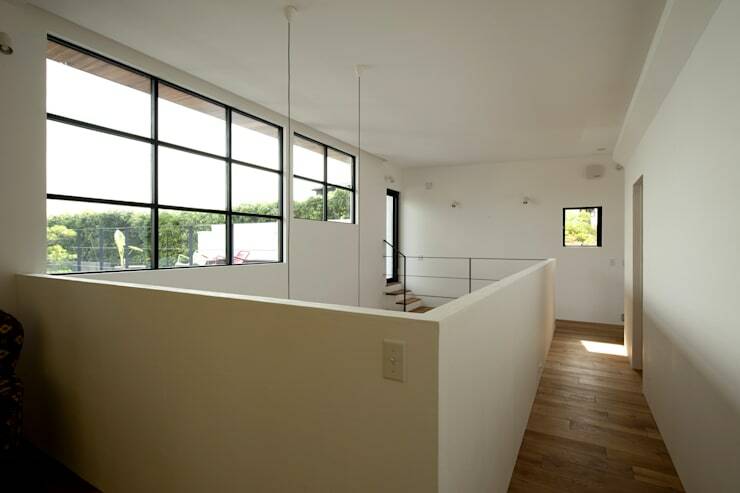 This is due to the high-set windows and the open design of the stairwell. The steps in the background lead to the upper deck we saw from the exterior. In the bathroom, we have a good example of how Japanese architecture commonly features elements that draw attention to a beautiful view. Here we can see how modern bi-folding doors have been used to create this effect. This architect also draws attention to the garden through careful attention to the interior elements. 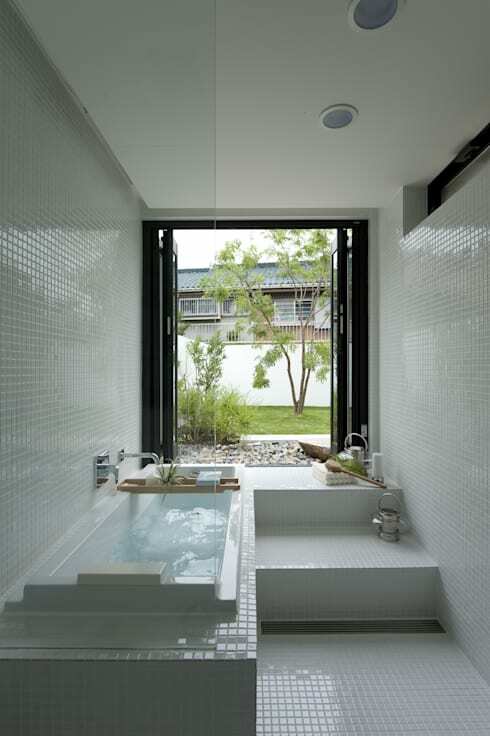 The bathroom has tiny bathroom tiles and simple lines of the bathtub and steps draw the eye forward. The bathroom is all-white and quite naturally, we are further led towards the lure of greenery from the garden. If this home has piqued your interest in Japanese design, check out Empty shell to timber belle: a Japanese home transformed. What do you think of the private oasis we have explored today? Let us know in the comments field below!